Adding to my increasingly unrealistic blogging workload, I am toying with another column called Geek Lotto Dreams, chronicling what geeky things I would do with an obscene nine-figure lottery payout. 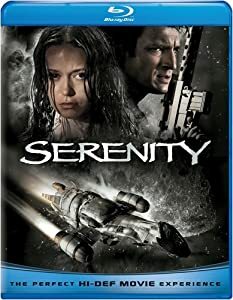 First up, I'd start a Serenity-themed restaurant. I'd call it the Blue Sun Grill, after I'd paid Universal and Fox and Joss Whedon all the necessary royalties for this boondoggle of a saloon to do it up right. Say what you will about the counter-factual probability of a U.S.-Chinese collaborative entity colonizing a retro-Western terraformed solar system, but an Asian-Western fusion steakhouse with Serenity's frontier-plus-high-tech design sensibility would be fun as all get out to eat at. Rustic decor, polished teak, mahogany, and butcher block tables (some with bench seating, perhaps) surrounded by metal-and-wood walls adorned with flatscreen digital "paintings" and fictional 'Verse travel posters. Digital meets frontier, east meets west, subversive meets sublime. Dishes would be named for the planets upon which they "originated," and as those planets were all given symbolic or referential names in Firefly, the dishs would all be gastronomic entendres. The fact that Heinlein was a gas giant planet in the series is a joke not lost on many, so a Heinlein souffle would be no small or simple dish. This isn't a Planet Hollywood amusement-park parody of Serenity we're talking about, but a serious bistro with legitimately complex and inspired fare and a sublimated snarkiness to its sci-fi verve. I'd wager lots of folk would eat there, not just the out-of-the-closet Browncoats. In fact, if the vision is executed correctly, non-fans won't even know this is a theme joint; it'll just be a somewhat off fusion restaurant. And if not, I'll be imaginarily rich, so I can keep it going as a vanity concern whether it's profitable or not. That's one Geek Lotto Dream. What's yours? Build a regular house, but have some kind of Batcave/missile silo/zombie holdout underneath it. ...yeah I think that about wraps it up. Wow...I have thought about preparing adequately for a zombie apocalypse wayy too much. I'd go a step further and build a "Guy Gardener's Warriors" restaurant/bar. Given the push for Green Lantern stuff that the 2010 movie will generate, the time seems right. One of the Green Lantern Annuals even included a fairly-well-fleshed-out design for the place. [url]http://www.chrislee.tv/falcon/[/url], and if there was enough left over, work on a Serenity mock-up. There is the TED talk, my thing could be called the TED DO. I would setup a tech center where 1000 people would have a 5 years contract where everybody has to work 20% of their time on assigned projects and 80% on personal projects. Grant would be given to invite people from elsewhere so minds could collides. People would be selected for Creative thinking There would a dormitory available for those that don't want to buy house or rent for only 5 year and an electric car pool where you can borrows a car when needed (there would be no parking lot as I think they should commute with public transit.) They would have a decent salary. I would receive a "first bid" on any invention from any project. But I would still need to buy the rights. I would pay all debts present and future of my entire family 4 married sons and 8 grandchildren [at present]) and take the rest of the money, buy an island out of the hurricane zone, build a nice road on it and a few cottages, and buy some really fast cars, they needn't be expensive, a Lotus 7 or 2, WRX STI etc. a boat and pray I don't kill myself the first month. On second thought, maybe just fund bio-diesel research. Showdown: Star Trek alien or gourmet cheese?